Discover a great assortment of lodging options from seaside cottages and bed and breakfasts to spacious condos and high-end inns. Finding a room last minute in the summer and on holidays can be difficult, so book early. Off season, finding a room is rarely a problem. 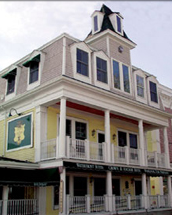 Provincetown's premier complex - offering lodging, dining, and entertainment -- 5 bars, restaurant and heated pool. 18 guestrooms; many with water views. Center of town and central to theWomen's Week events including the Clambake, Sauced, Idol, plus the comedy shows of Kate Clinton, Julie Goldman, Vickie Shaw, and more. Family owned and operated, The Seaglass Inn & Spa offers families and couples a peaceful retreat nestled in the hills of Provincetown. The combination of The Seaglass Inn & Spa’s amenities, family-friendly ambiance and location provide a welcome alternative to the large harbor front hotels and bustling beachfront. At the hotel, guests can experience a true escape in the heart of Cape Cod. Courtesy shuttle available.